WE’VE become accustomed in Britain to football being devoid of atmosphere, stadiums lacking a certain something (although they are undoubtedly more comfortable), and matchday culture being characterised by grinning presenters pretending to be Saturday morning children’s TV hosts. Although this is clearly what a very large audience is happy with, hence the crowds are higher than ever and the buy-in very evident, there’s something missing from modern football. It would be inappropriate to take the line “all modern life is rubbish”, but people brought up on terracing, crowds chanting and a feeling of being part of the action can be alienated by the modern football experience. In appealing to a new clientbase, football has marginalised a large chunk of traditional attendees. Like most things in life, commerce caters for the next generation and if that next generation wants to take “selfies”, see the act of watching football as a tourist attraction and, at the same time, pay extortionate ticket prices, then the game’s grandees will surely maximise that audience. Cynical? Perhaps. It is not often you visit a ground today and come away having enjoyed being part of a mass body of people enjoying not only the football, but also being inside a small ground, virtually full to the rafters and finding the “oooohs….and ahhhhs” both heart-warming and reassuring – reassuring that old fashioned spectating does, after all, still exist. This is what can still be found at Griffin Park, home of Brentford. It might not be a spectacle that’s around for much longer. The plan is for the Brentford Community Stadium to become the new home of the Bees, a 20,000-capacity site near Kew Bridge. Doubtless this will provide a springboard for further success, but it has been a long time since Brentford attracted 20,000 to their home games. In fact, only nine seasons in their long history have the club enjoyed such attendances, the last being in the early 1950s. It’s a big ask when you have Chelsea on your doorstep. Today, Brentford average 10,500 at Griffin Park and with a capacity of 12,300 that makes for a cosy atmosphere. You can understand why people like visiting the club. It’s one of those grounds that’s pretty much hemmed in, so obviously expansion is nigh on impossible. It’s also the type of stadium that offers you teasing glimpses between the houses – a row of seats here, an entrance there, and above it all, giant floodlights from an era when we probably bashed out the iron and steel for them ourselves rather than some corner of south east Asia. Brentford, unsurprisingly, is an area that provides graphic evidence of the effects of globalisation. Leave South Ealing station and you see shops selling Polish and Russian produce, not to mention the many fast food outlets offering Nepalese food. And it was not hard to guess what the shop bearing the hoarding “CCCP” was selling. Turn left from South Ealing and you’ll end up with one of the borough’s most well known achievements – the Ealing Film Studios. Given the cosmopolitan nature of the area, it is perhaps ironic that something so quintessentially British as Ealing films should be created by a Jewish son of an immigrant, Michael Balcon. It was tempting to forget the football and go and take a look at the place where they made such classics as The Lavender Hill Mob, The Man in the White Suit and Passport to Pimlico. But never mind The Titfield Thunderbolt, I was looking for a thunderbolt shot (why don’t we call these explosive shots thunderbolts any more – remember the Bobby Charlton thunderbolt?) from the likes of Lasse Vibe or one of his team-mates. Griffin Park has many contact points with regards to public transport and it lives in the shadow of the very precarious Great West Road, that one-time essential artery for big business. The stadium has always been very identifiable from the air, and the club used to have huge advertisements on the roof of the stands bearing the names of airlines – KLM, for example. Anyone flying in or out of Heathrow would have flown over Griffin Park at some point. It was also well known for having a pub on every corner of the ground. Not so now, for one of them, The Royal Oak, closed in 2016. Three is still good going in today’s environment, but is does rob a lot of pub quizzes of a question that’s been asked for decades – “which football club has a pub on every corner?”. Pub closure aside, these seem to be good days for Brentford. This is their third season in the Championship and they are still faring well. Tucked in mid-table, they were certainly better off than their visitors – Bristol City – on the day Game of the People turned up. Brentford had lost two of their last three league games, coming back to win 5-3 at Burton after two home defeats at the hands of Wolves and Huddersfield. Bristol City, despite their lowly position, had been in decent form and were unbeaten in four games. 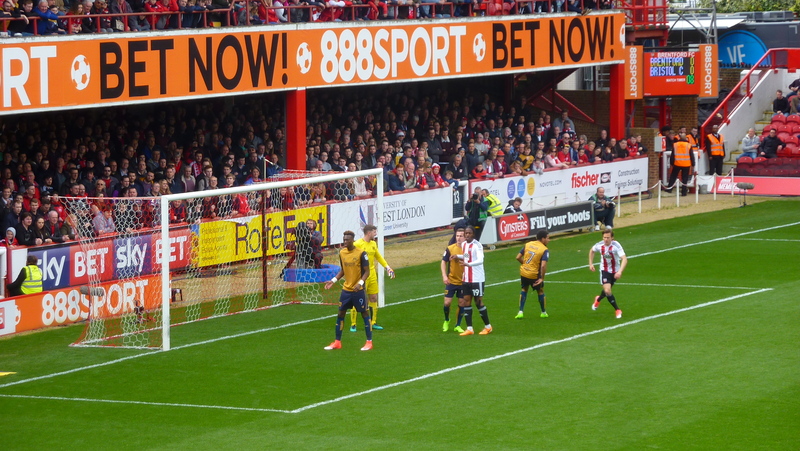 Their fans travelled to Griffin Park in force and were extremely vocal about the lack of support for the home team. Unfortunately, Bristol City were poor for most of the 90 minutes. They fell behind on 18 when a pass across field from Ryan Woods found Sergi Canos and he shot low past Bristol City goalkeeper Frank Fielding. The rest of the Brentford fans satisfied themselves by taunting the City fans with “that’s why you’re going down” as their team struggled. It was soon 2-0 as Danish striker Lasse Vibe, whom I’d seen in action for Gothenburg a couple of years back, back-headed the ball past Fielding. Vibe caused City’s defence problems for most of the game. City’s Chelsea striker, Tammy Abraham, who has won plaudits during his loan spell, had a couple of dashes that threatened to reduce the arrears, but they came to nothing. If Abraham is considered to be the future of English football, he didn’t really show it in this game, although he did hit the woodwork with a header. That was it, then, a 2-0 victory for Brentford, keeping them more comfortable in mid-table and making City’s next few weeks a little more anxious. The crowd filed out of the ground, many of them believing that Brentford have done enough this season. “Don’t forget we’re back here on Tuesday for Leeds United,” reminded the man on the tannoy. “We’ll get murdered,” muttered the Brentford fan shuffling down the tightly-packed stairs. “They’ll bloody thrash us and we’ll need all of those high-vis jackets to be in use,” he laughed, pointing to the stewards coats locked behind a cage on the stairs. Next Entry Celtic are worthy champions, but what happens next?